Deciduous trees sprout new leaves in the spring, then drop them in the fall. Coniferous trees are evergreen and hold their needles or scales year-around. Those are the tree rules. 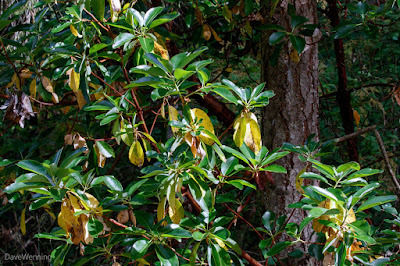 The Pacific Madrona (Arbutus menziesii) breaks those rules. They are evergreens, deciduous trees that stay in leaf year around. 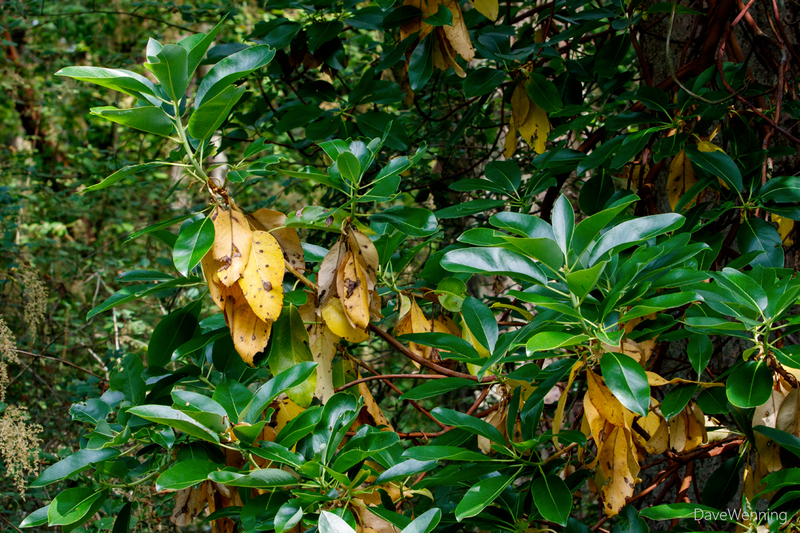 Actually, Madronas do drop their leaves, but not at the usual time or in the customary way. Like other deciduous trees, they sprout new leaves in the spring. Then in midsummer, the one year old leaves turn yellow and drop and that is happening right now. 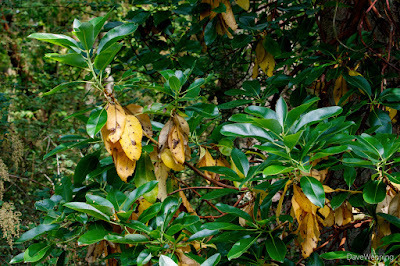 Rhododendrons, the Heath family cousins of Madronas, do this as well, but they will drop their two year old leaves in the summer. 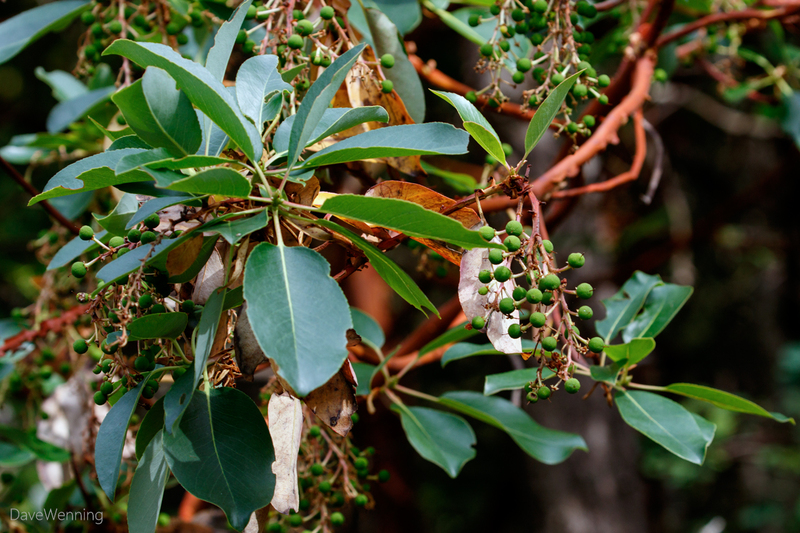 Although the Madrona looks like a tree, it really behaves more like a large evergreen shrub. After an unusually spectacular flowering this spring, Madronas are also setting their fruit right now. As summer progresses into fall, the berries will gradually turn yellow, then a bright orange-red color. This is the source of one of the tree's nicknames, "strawberry tree." Another rule the Madrona breaks is with its bark. It's really more like skin. Every year, as the tree grows, it sheds its bark revealing a fresh, new layer underneath. In a few weeks, the new layer will turn its characteristic red color. 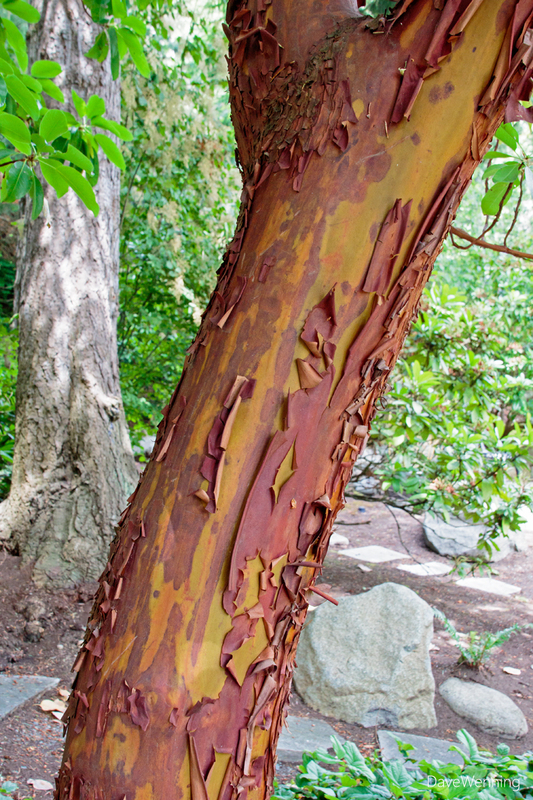 In this respect, the Madrona behaves more like a reptile than a tree. Also like a reptile, the tree is "cold-blooded." Place your palm against the trunk. Even on the warmest summer days, the tree will always feel cool to the touch. Yesterday, I discovered this Madrona seedling coming up in my yard. 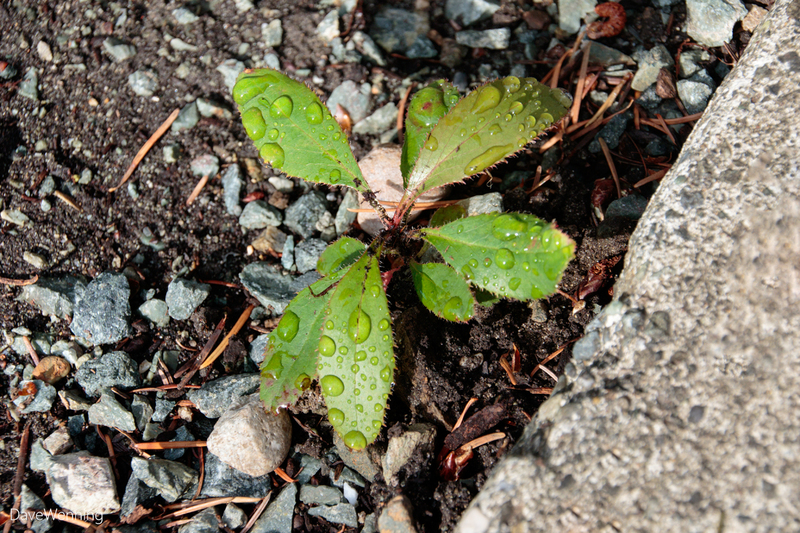 Unfortunately, it has sprouted in a gravel pathway. As a rule, the tree does not transplant easily. I am going to try and move it to a better location anyway. Maybe this seedling is still young enough to survive the process. By the way, my "Miracle Madrona" is still coming along nicely. Some may notice I use the common name "Madrona." 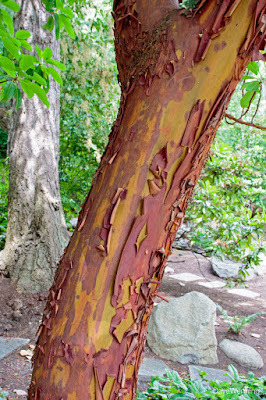 Others in the Pacific Northwest call it Madrone or Arbutus. It seems what we call the tree will depend on where we grew up. In my case, like the Seattle neighborhood, it was called Madrona. That's the word that sounds right to me. I have enjoyed the discussions we've had on this blog about its name. Someone should tell Google to stop responding with "Showing results for Pacific Madrone." At least Bing uses "Including results for..."
Dr. Arthur Kruckeberg called the Madrona "one of nature's most ornamental works of art." As we know, great art often breaks the rules. The Madrona is no exception.